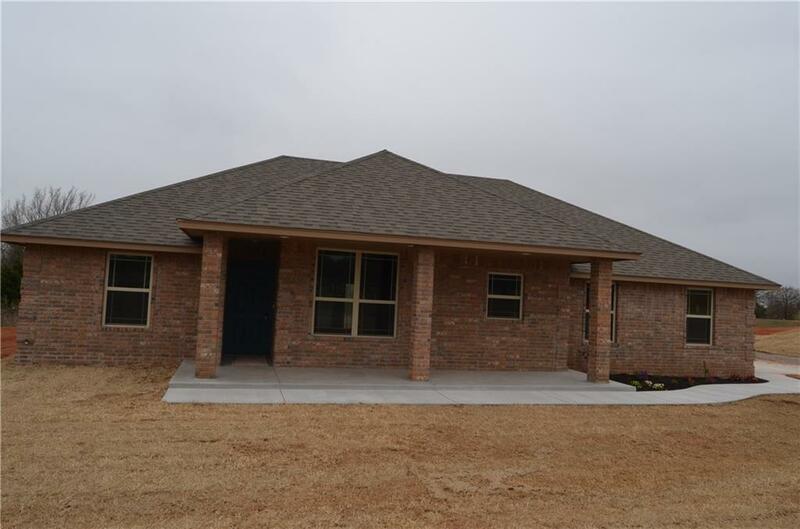 Beautiful, brand new home, large open floor plan with granite throughout kitchen and bathrooms. Large front and back porches. Stainless steel appliances, dishwasher, freestanding range/oven, garbage disposal and microwave. Stainless steel sink with pullout sprayer and soap dispenser. Tumbled marble back splash, led can lights, led lights throughout the home. Bedrooms opposite the master. Nice master suite with shower and whirlpool tub and separate toilet room, very large closet, double vanities, all bronze fixtures throughout. Wood tile floor in entry, living room, dinning room, kitchen, hallways and both bathrooms. Carpet in the bedrooms only, this is a really nice home. Planted flower beds in the front, sidewalk from garage to front of the home. Blinds in the French doors. All custom made cabinets, solid wood. Great laundry room with cabinets for storage. Two car garage with utility closet.